Display a popup message if a user forgets to select duplex on large jobs. Show a dialog displaying environmental impact statistics about their job, such as, the amount of carbon dioxide equivalent greenhouse gases produced. Prompt the user to confirm large jobs before printing. Automatically route large jobs to more efficient high volume printers. Giving discounts during off-peak times. Least-cost routing - suggesting a more cost effective printer. How Easy Is It To Write A Script? 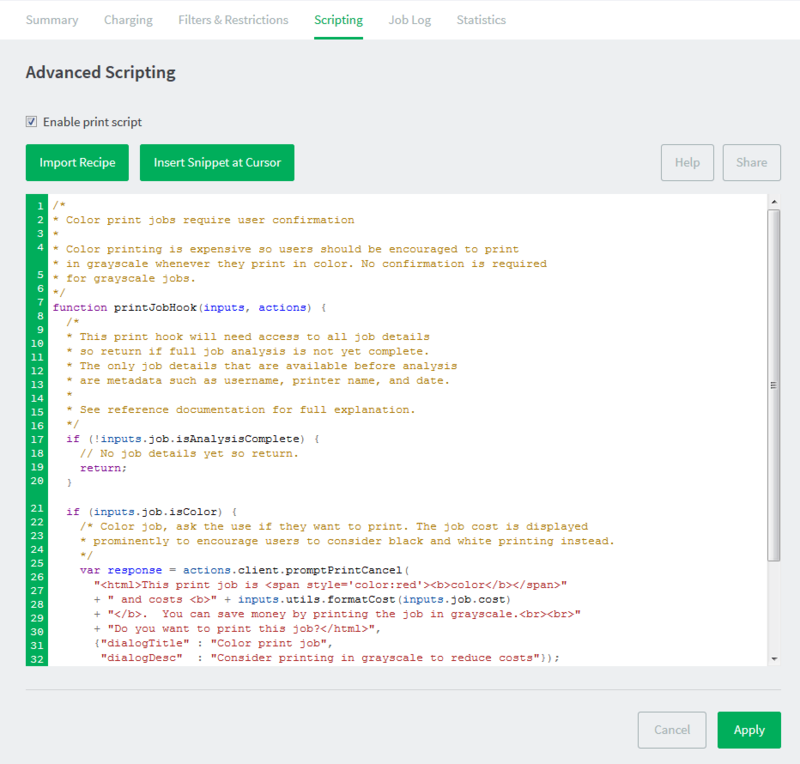 Check out the manual for full API reference documentation and tips on how to write your own print scripts. Do you have an idea for a script? Take a few moments to hit the Share button in the application and let us know about it! Color printing is expensive so users should be encouraged to print in grayscale whenever they print in color. No confirmation is required for grayscale jobs. Enforce a company/corporate print policy designed to reduce toner and save paper by discouraging bad habits. The policy script reminds users to print double-sided and not print emails and web pages in color. This recipe also demonstrates advanced HTML dialog layout. If a user attempts to print a large job, educate them with the organization's "Go Green" initiative. The message displayed adapts to the job's duplex setting. 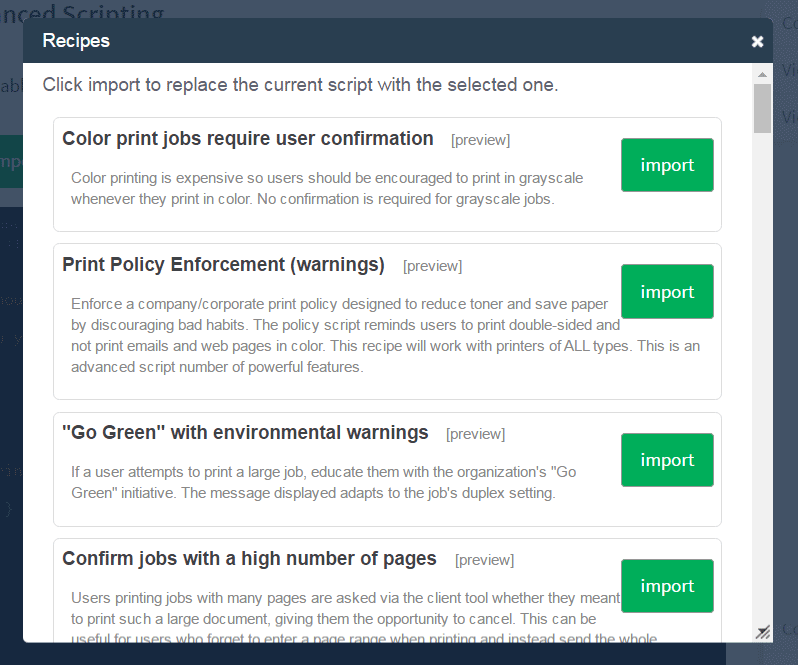 Users printing jobs with many pages are asked via the client tool whether they meant to print such a large document, giving them the opportunity to cancel. This can be useful for users who forget to enter a page range when printing and instead send the whole document. An organization has a fleet of compatible printers, each with different operating costs. 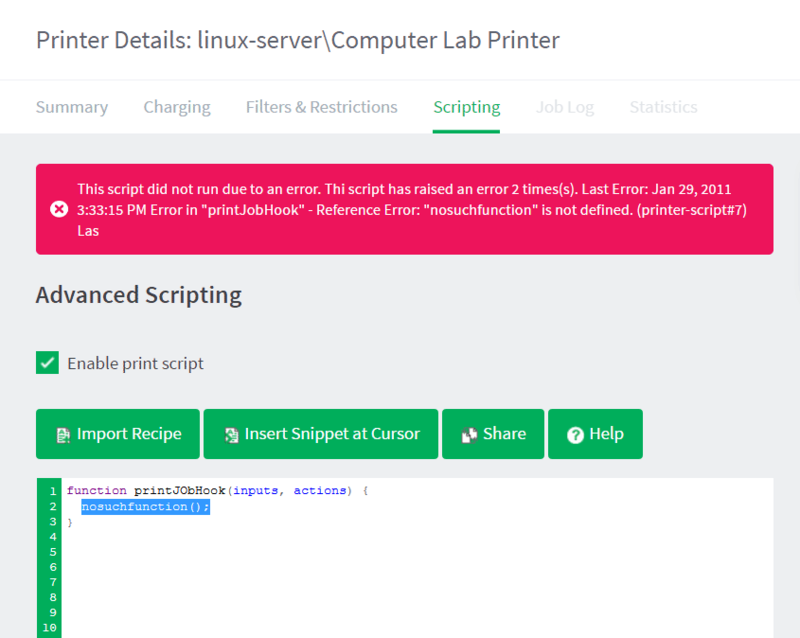 This recipe calculates the cost of the job on the candidate printers and redirects the job to the cheapest with the user's confirmation. Users may accidentally (or without thinking) print multi-page documents with many color pages. When printing jobs with a high number of colour pages (e.g. >20), users will be given a choice to either convert their job to grayscale or cancel it. Users who are not running the client software will have their jobs canceled automatically. Color printing is expensive so users should be encouraged to print in grayscale. When a job is color prompt the user to send the job to a grayscale print queue. Please note: This script does not change the job to grayscale the job may still print in color on color printers. Members of the Students group are only allowed to print up to 100 pages. Jobs larger than this will be canceled with a notification. This recipe demonstrates group-level restrictions. Implement an organization wide policy to discourage printing of emails in color. Users printing emails in color will be informed via the client software of the policy and they will need to confirm their action. Implement an organization wide policy that no emails should be printed in color. Often emails contain color in links or headers that adds no value. This script automatically converts all emails (printed from Outlook) to grayscale. Color printing is expensive so users should be encouraged to print in grayscale. When a job is color the job is held in a release queue and the user it notified. They must then release the job from one of the release station interfaces. Grayscale jobs print as normal. Users are required to enter a valid approval code to print their job. Approval codes are pre-defined and known only by privileged users, e.g. teachers. Users who do not enter a valid approval code will have their jobs canceled. Jobs sent from workstations in a specified subnet are allowed, other jobs are canceled. This script demonstrates network level restrictions. Some organizations have known problem documents such as large spreadsheets that if accidentally printed will print thousands of pages. This recipe will check for a known problem document and alert the user and ask them to confirm their actions. This recipe imposes a fixed limit on the number of color pages a user can print per day. A color page quota is a better solution than separate balances for color and black & white. Separate balances are more confusing (two accounts to manage), and also can lead to waste, as users with no black & white credit remaining will simply revert to color printing. It's always a good idea to reward good behavior. This recipe help you implement a campaign to discourage color printing and encourage the use of duplex (double-sided) printing. It will track a users usage and if they hit the target of 10 continuous days of printing without using any color and/or duplex will be rewarded. This recipe will cancel printing once a specified number of pages is reached. The user is informed that their job has been cancelled and prompted to click the link in the popup to upload their documents to Job Ticketing. This popup message is displayed to the user at the time of printing to inform users about Job Ticketing. Users can dismiss this message and the message will not be displayed again. Note: The popup message appears only when the User Client is actively running.